Wasps are most active during the summer months. While they are never our favorite house guests, they do perform several important functions, including pollination of plants and eating other insects, which helps to keep the insect population under control. In addition to these positive functions, they can also create problems for humans when they build nests in and around our homes and, as we all know, they have a nasty sting. 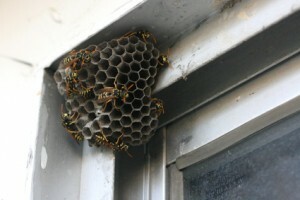 If you find nests or see multiple wasps in or around your home, you should contact a wasp exterminator for assistance. Eco Tech has been a leading Minneapolis Pest Control Company for more than five decades, providing superior customer service and natural pest control options for those in the area. Wasps tend to build their nests in dark areas where they think they will be safe. Old houses, sheds or big trees are ideal spots for them to live and provide them with the protection that they are looking for. They are able to live in trees, holes or small cracks in your home or business, making them a threat virtually anywhere.The only way to get rid of them if they have invaded your house or your property is by completely eliminating their nests. Killing them individually does not solve the problem. Eliminating their nests is not an easy process and should always be completed by a professional exterminator. The trained professionals at Eco Tech have experience handling wasps and other bees safely and will eliminate them from your property permanently. Eco Tech uses a safe, non toxic product line to exterminate the wasp nests in and around your home. The products we use are highly effective at killing the wasps and make their nests unusable, but these products are also safe for the environment and will not harm others, including your children or your pets. Our team can assess the area quickly, identify the location(s) of the wasps nests and work quickly to remove them once and for all. Our extermination team has years of experience in the Twin Cities, MN area, and stays up to date on all industry standards as well as state of the art advancements. The bottom line is that you should not battle wasps on your own this summer. Our team is professional, courteous and will not try to sell you services that you do not need. We are proud of our customizable insect programs, and do not promote annual contracts and all of our work is warrantied for four years. Call Eco Tech at 763.785.1414 today for assistance.